Silent Disco event producer Silent Events® is more than just a wireless headphone rental company. Silent Events will provide you with full-scale event production. From sound engineers, DJs, and distribution specialists to lighting, staging and tenting, Silent Events delivers it all! American owned and operated, Silent Events is the company that first brought the silent disco experience to the United States. Silent Events has been setting the standard for silent discos in America for over ten years. With over one hundred Silent Events produced annually, we truly are America’s first, largest, and most experienced silent disco providerSM. Sometimes sending a box of headphones and wishing you good luck is just not enough. Rather than just send you a box of headphones, we feel that it really pays to have a trained sound engineer on site to install the transmitters, ensure all equipment is working properly, and resolve any transmitter interference issues. Our crew will mix the sound and microphone mixes live, work with the DJ’s inputs/outputs, run cabling, and help manage the silent party with you. It’s also important to have a distribution specialist at the entrance greeting your guests, fitting them with headphones, demonstrating how to operate the headphones, and servicing and sanitizing the headphones between every use. After your event, Silent Events’ experienced crew members will package and ship out all of the headphones and sound equipment. Having the Silent Events team on site ensures your event will run smoothly, allowing you and your guests to enjoy the event to its fullest. Ryan Dowd, creator and owner of Silent Events, Inc., was the first person in America to bring this wireless technology and concept to festivals such as: Bonnaroo, ESPN X Games, Vans Warped Tour, Camp Bisco, Wayhome Music and Arts, Bamboozle, Essence Music Festival, Treasure Island, South by Southwest, Bear Creek, Wakarusa, North Coast Music Festival, The Great GoogaMooga, and Jam Cruise. Silent Events is the holder of a United States patent covering wireless multi-listener headphone systems including light emission changes dependent on selected transmission channels. The outward displays of luminescent color from the headphones themselves provide a unique visual view to other listeners or other spectators of the venue, creating a new experience in the wireless multi-listener arena. Such a system allows for each listener to select different channels for different transmission sources and the colored lights indicate the channels listeners have chosen. Silent Events is the exclusive Silent Disco provider for universities and colleges across America. Silent Events founded the University of Silent Disco® (USD) to specialize in producing on-campus silent discos. Silent Events is a fully-insured production company and has a multitude of experience working with universities, students, and administrators. We have produced silent discos on amazing college campuses such as: USC, Vanderbilt University, LSU, University of Miami, UCLA, University of Florida, North Carolina State, University of Houston, Cornell University and TCU. Visit the USD website for an extensive list of universities we’ve worked with. 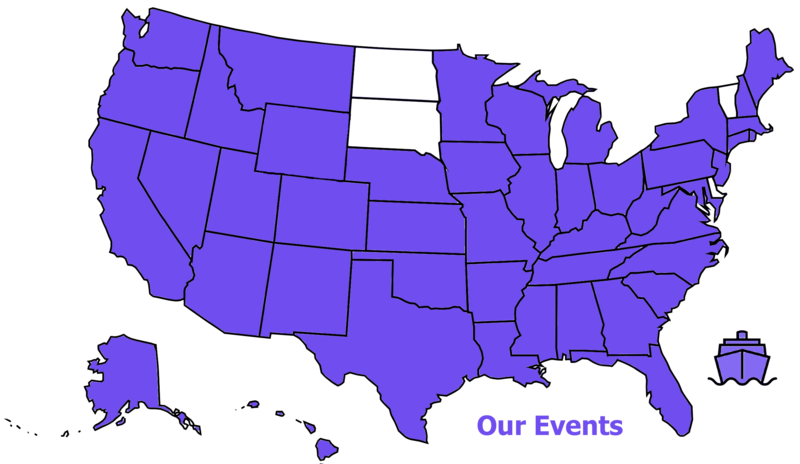 Throughout our journey of over nine years serving as the American innovators of the silent disco, we have produced events in the most amazing locations across America. These locations include the unique spaces of: the beaches of Hawaii, Golden Gate Park in San Francisco, rooftops in New York City, the Denver Zoo, JFK airport, Miami’s South Beach, a Trans-Atlantic DJ Battle between Chicago and Berlin, ice skating rinks in Tahoe, and the VIP backstage area of a live rock show. We even produced a USA Network television premiere party for the show “Necessary Roughness” in the middle of Times Square. Think of the power and range our transmitters had to have to broadcast in Times Square! Silent Events has been called upon by some of the biggest names in both the corporate and entertainment worlds to produce silent discos, silent ravesSM, silent concertsSM, and more. We are proud to have partnered with Coca-Cola, Beats Audio, Nike, Red Bull, Visa, Live Nation, Budweiser, Philips, Vitamin Water, Jack Daniels, Heineken, Tostito’s, PowerAde, USA Network, Groupon, Nationwide Insurance, Delta Airlines, and Coke Zero. Head over to our Partners page for a complete roster of clients we’ve worked with. When the Warner Bros.® props department needed sleek, glowing headphones for silent disco scenes in an episode of Lethal Weapon, we got the call. When DJ Jazzy Jeff wanted to film and perform a silent disco, we were the provider he trusted! When Passion Pit and Mark Foster of Foster the People wanted to do a rarely seen DJ set, we were the company they used! When John Popper from Blues Traveler and DJ Logic wanted to do a silent concert, we were there! Other well-known DJs we’ve worked with include: Tone Loc, DJ Kool, Nick Cannon, Cash Cash, Samantha Ronson, Gramatik, Wick-it the Instigator, Robert DeLong, Jared Dietch, Quickie Mart, DJ Equal, Jonathan Toubin, Classixx, Orion, and Le Chev. Silent Events’ customized state of the art, wireless three-channel headphones and in-house custom-made transmitters are what set us apart. Silent Events’ equipment is extremely durable, has long-range reception, and produces crystal clear sound. Our transmitters have been designed to be the very best in the industry. We are pleased to offer our next generation of headphones, the Silent Discglow Light Up HeadphonesSM. These headphones glow a certain color depending on what channel you’re listening to, making the crowd a part of the light show! They are so comfortable you’ll forget you’re wearing headphones! All of our party headphones contain three separate channels, giving participants the option of choosing between three DJs or bands playing simultaneously. This ability to provide various types of music can greatly increase the demographic and success of your event. Since we were the very first company in the America to use this technology, we’ve taken the time to make our equipment look, feel, and sound the very best. Ryan Dowd, creator and owner of Silent Events, has been working in the music industry for over two decades. He has worked professionally in the fields of audio engineering, lighting design, artist management, and event production. The experience he gained working for acts like Widespread Panic, American Idol winner Taylor Hicks, the Black Crowes, Drive-By Truckers, North Mississippi All Stars and agencies such as APA, Madison House, PGA, and Red Light Management has been instrumental in shaping the superior production behind Silent Events. Dowd takes a lot of pride in his hands-on approach and always strives to provide his clients with the highest quality event possible. This is what sets Silent Events apart from other companies. Since the conception of Silent Events, we have been bringing the silent revolution to the people. Locations and uses of our technology are hindered only by your creativity. Choose Silent Events and let us help you build your event from the ground up. Make your next event truly memorable with Silent Events, Inc.
Do they offer staff? DJs? Lights and trussing? How do they deal with transmitter interference issues? What sound and lighting production experience do they have? Do they make any of their own gear? How do they amplify the sound to the headphones? Get in touch with Silent Events today to ask us these important questions, and let us begin planning your next wireless headphone event.